The AptarGroup, a packaging delivery solutions provider based in the US, utilizes Sesotec (formerly known as S+S Separation and Sorting Technology GmbH) metal separators to improve its product quality and reduce down-times of injection molding machines. Before the use of metal separators, magnet grids were inserted in the material feeders of Aptar production lines that predominantly comprise injection molding machines. These magnet grids, however, were not efficient enough to remove all metal particles from the hot plastic material Furthermore, magnets only attract ferrous metals. 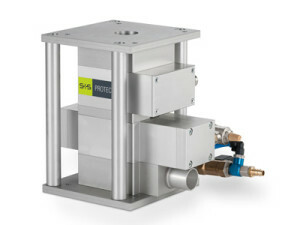 Sesotec’s Protector type metal separators are installed directly above the material inlet of injection molding machines. They detect all magnetic and non-magnetic metal contaminants even if such contaminants are enclosed in the product. Metal particles are removed by means of a “Quick Valve” reject unit. “We are particularly convinced by the detection accuracy of these systems. The daily performance tests demonstrate that the systems operate reliably, that fewer metal particles reach the injection molding machines, and that these machines therefore are reliably protected against functional disturbances,” according to Aptar’s Plant Maintenance Engineer and Production Manager. The AptarGroup has so far installed more than 20 Protectors in its production lines.